At Christleton High School we aim to develop and stimulate students’ curiosity, interest and enjoyment in Computer Science and I.C.T. Students should gain skills to support lifelong study and prospective employment in a modern technological society. The department has a suite of 4 dedicated computing rooms, with colour printing facilities, scanners, digital video and still photography. Students have the use of a large number of software applications and packages to support learning. In Key Stage 3 all students attend discrete Computer Science lessons for two periods a fortnight. Students follow a tailored programme of study during Year 7, 8 and 9. This has been designed to incorporate skills in application packages which the students should find useful in other subject areas, together with an understanding of the principles of computer science. Topics covered during Key Stage 3 include an emphasis on the safe use of computer systems and online safety. Students will undertake a number of different projects thereby gaining a proficiency in common applications including the Microsoft Office suite as well as creative applications including Adobe Creative applications such as Photoshop and Dreamweaver. Students also learn about computational thinking and gain skills in programming through the use of Scratch in year 7 and Python in year 8. They study simple boolean logic and an introduction to binary. During Year 9 students start the European Computer Driving Licence, a vocational Level 2 qualification equivalent to a GCSE. This qualification is well-regarded amongst employers and students will complete modules in the use of Word, Excel and Powerpoint. They will demonstrate their competence during on-screen examination that take place on a termly basis. Students continue this work in their Core ECDL lessons throughout years 10 and 11 for one period a fortnight. 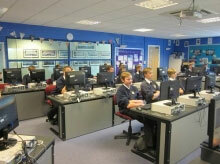 In addition to this students have the option of choosing from either GCSE Computing (OCR) or GCSE ICT (WJEC). These qualifications receive five periods a fortnight. ICT is used extensively throughout the school and students have access to ICT facilities in many departments including other ICT rooms and tablet devices.